Sports bras are the unsung heroes of workout gear and seventy percent of women wear bras that don’t fit them. If you are wearing a bra that does fit you, it’s going to make a huge difference in your workout. 1 Why sports bras are important? Why sports bras are important? It’s really important to wear a sports bra while exercising as it reduces bounce dramatically compared to a regular bra. It’s not just that; it’s much more comfortable and can give you more confidence. 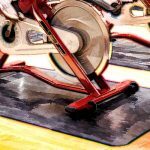 It’s as important as getting the right gear if you are going to exercise. Especially for women with bigger cup sizes, the sports bra is really important just to feel good during training. You need to wear a sports bra if you are active, if you run, if you jump or if you do any physical workout where you are moving up and down. Breasts do not have much support naturally and wearing normal bras gives you only enough support to walk around and do not support you enough for jumping or running. With constant bouncy movement, the ligaments supporting your breasts get weaker. So, get a sports bra if you don’t want a saggy look and obviously to reduce pain and discomfort. There’s a huge difference between sports bras and normal bras. 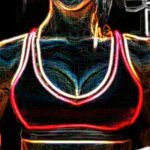 Once you are going over from working out in a normal everyday bra to working out in an actual sports bra, you do notice a difference and it is a lot. 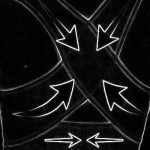 If you are just in a regular bra, it kind of hurts and strains, bounces everywhere and becomes really uncomfortable while doing any type of workout. Regular bras are not very supportive and if you are doing a high intensity exercise, you can actually damage the muscles and ligaments around your chest. Wearing a badly fitted bra can actually cause premature sagging or dripping in your breast. It can also affect your running style and performance. Embarrassment is another key factor. The more you can prevent that, the better. A quality sports bra that fits and works is just as important as great running shoes. There are a few things that women should look for in a sports bra so that they are not miserable while working out. First we would look for a very thick band underneath the bra and this is important for support. You also want to get thick straps over your shoulders because if you don’t have that over your shoulders, the straps are more likely to dig and we all know that’s not very comfortable. We also want the bra to be made up of a firm material. If you get one of those fun yoga bras that stretch a lot, that’s not good for support. Lastly you might want an option to loosen or tighten the bra with the help of hooks. Remember that the most comfortable bra may not always provide the best support. So, a useful way to check is to jump up and down in the changing room and see if it feels secure without restricting your movement. Try moving your arms and upper body around and make sure the bra remains in place. The actual lifetime of a sports bra is only one year so it’s very important that you are rotating bras and getting them new every year. You see hundreds of shapes and sizes in a store and one rule that is consistent is that you have to be comfortable in order to have a good workout. Find a bra that’s tight enough to keep you from bouncing but loose enough so you can breathe. When you take every running step, two and a half times your body weight is coming right back at you as ground reaction force. That stretches your ligaments in your breast tissue and you want that bounce down. As it turns out that ‘A’ cups move about half inch in all directions and ‘D’ cups move about two to three inches. So if you wear a right sports bra, you can cut that movement into half. Before purchasing the right sports bra, you would want to check the straps, the cups and the band. You might want to give the straps a small tug to see if they are not flexible at the front. At the back, the straps may be flexible but not the front as the front will hold the breasts firmly. When you adjust the straps, they should not easily slip off your shoulders. If you lift your shoulder straps then there should be only a one to two inch give. Adjusting the straps to your own body shape will give you the best fit. Around 70% support from a sports bra comes from the under band so it’s really important that it fits correctly. You can check the fitting by putting the bra on and place a finger underneath the band and you should be able to pull it away from your body by one inch. Anything more than that, you should get a downsized one. Check that the under band is level all around your body. If its riding up your back then it’s definitely too loose and you need to go undersize in the band and upper size in the cup. You also need to make sure that the bust is completely encapsulated into the cups. Ensure that there is no bulging at the sides or the front. If there is then the cup is too small. If the fabric is wrinkling or gaping, then this suggests that the cup is too big or the style may not be right for you. It should give you the feeling of fitting comfortably and securely. The encapsulation should not dig into the breast. The underwire should sit nice and flat against the rib cage. Every woman is different and the body shape is different. The under band and the cup size you choose will be linked by something bra manufacturers call cross grading system. What this means is that if you find that you need to go down a size in the under band, you will need to go up a size in the cup. So, if you think that you are 34D for example, but find the under band too loose, then you should try on a 32DD bra size instead. Or if the under band of the 34D is too tight, you should try on a 36C. You should wash your sports bra in cold water and only use a mild detergent. Fabric softener and bleaching is a strict no as that messes with the spandex fibers. When you dry them, try and line dry them or flat dry them if you can. If you have to put them in the dryer, set it on cold. Those spandex fibers don’t like heat and that’s what breaks them apart.